A couple weeks back the boy & I went to a thrift store quite a ways away. He was looking for video games & I was just along for the ride. I think the place was called 2nd & Charles, but basically everything looked brand new. I don’t know if you could even call it a thrift store, but they sell used games, books, dvds, music etc. I got sucked into the cookbooks after I yet again, failed to find Hocus Pocus in a store. Honestly, such a brilliant Halloween movie, a couple weeks before Halloween & it’s practically impossible to find. Thankfully I have the best boyfriend ever and he successfully surprised me with a copy! Anyways, I found this awesome cookbook called Soup Bowl & we decided to start up a tradition of Soup Sunday’s! Brilliant. 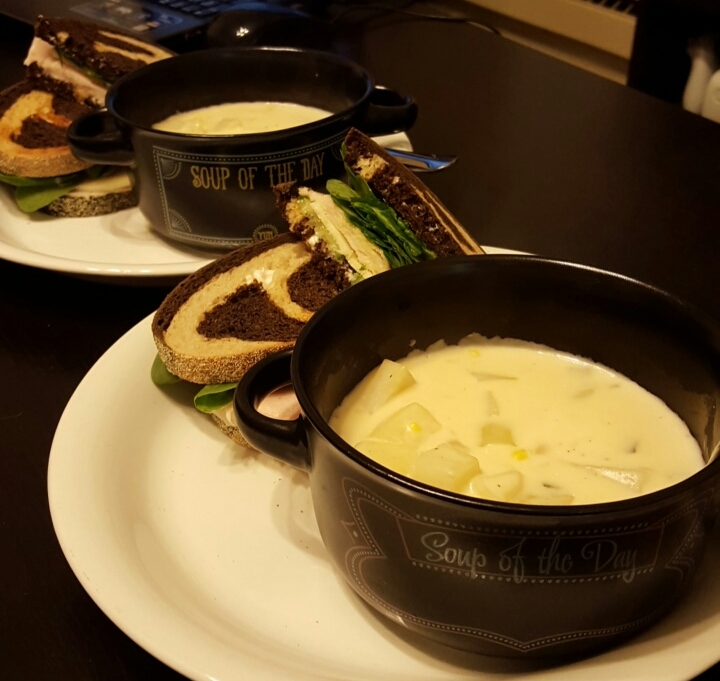 We both love soup & with fall here & winter on its way, what better time to start a soup tradition!? We both love cheese & basically all things carb related. He picked out a recipe in the book called Corn, Potato & Cheese Soup. We decided to try and make it a little healthier by replacing the heavy cream with low-fat cream cheese. It probably didn’t make it much healthier, but maybe reduced some of the bad saturated fats that heavy cream has. One can dream right? Well the soup turned out delicious! It was creamy, thick, cheesy & oh so good. I hop you all enjoy this as much as we did! Begin by adding butter to a large pot & set the heat to low. While butter is melting begin chopping the 2 shallots & garlic cloves. Add to pot of melted butter and stir occasionally for 5 mins or until shallots are softened and garlic is fragrant. While shallots & garlic are cooking, peel your potatoes & cube into small bite sized pieces. After shallots & garlic are softened add your cubed potatoes. Cook for approximately 5 minutes, stirring occasionally. Add the flour to the pot & stir until incorporated somewhat evenly. Cook for about a minute. Add white wine & mix. Slowly add milk & chicken broth, then turn heat to medium-high. Bring mixture to a light boil stirring frequently. Once mixture starts to boil turn heat down and allow the mixture to simmer. Stir in corn, sage, swiss, cheddar, cream cheese & salt/pepper. Allow to simmer for approximately 20 minutes or until potatoes have just a slight crunch to them. Cook a little longer if you like softer potatoes & ENJOY!